There are a wide variety of trailer connectors. They can include anywhere from 2 to 7 wires. The type you use will be determined by the needs of your vehicle and trailer. Here we will cover some of the most common types. 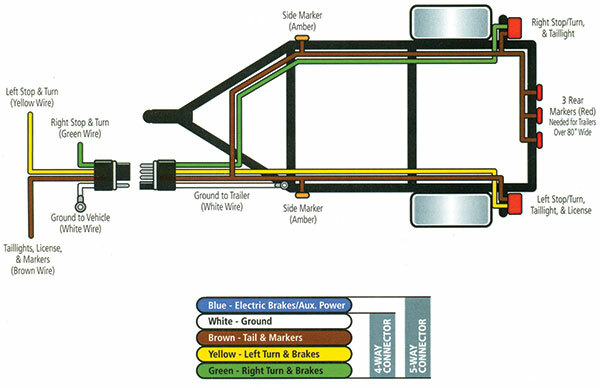 Below is a diagram of the typical 4 or 5 way trailer wiring. You should always confirm the actual wiring of your trailer before making a connection. Never assume the trailer or your vehicle is wired according to standards. 4 Way trailer connectors are very common. They can handle the needs of basic boat and utility trailers. 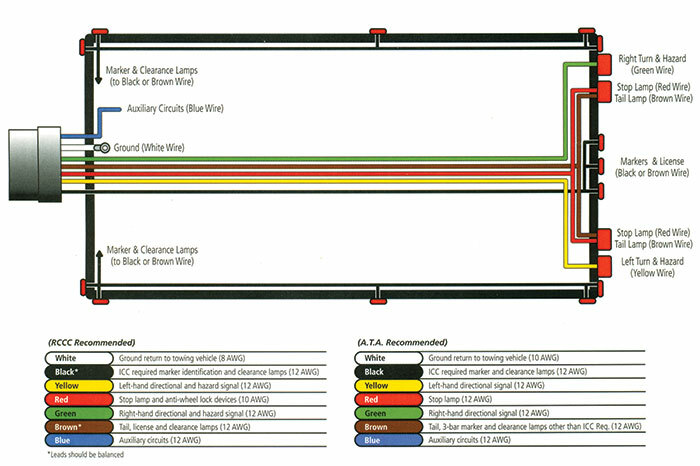 The allow for the hookup of three lighting functions – running lights, turn signals, and brake lights. Both flat style and round style connectors are available as 4 way. 5 Way connectors handle the same lighting functions as 4 way and the extra wire / pin is available to handle another function. Typically the 5 Way connectors are used for trailers with surge brakes – the additional wire is tapped into the backup lights to trigger the disengagement of the braking system. In addition to basic lighting functions, 6 Way trailer connectors include two extra wires/pins. Typically these are used for electric brakes and a 12V power lead. 6 Way round connectors are commonly found on horse trailers, whereas the flat style are seen more on campers. In addition to basic lighting functions, 7 Way trailer connectors have three extra wires / pins. These can be used for electric brakes, 12V power, and backup lights. Round pin connectors exist, but are uncommon. Most feature flat blade type connectors.